1. Goal The student shall become aware of, experience and understand what ecology actually means. The students shall be studying plant, animal and human ecology, habitat, systemic relationships, ecological processes, growth of food for plants, animals and humans, urban farming, aesthetics of true landscapes, etc. Choose any particular, real site within the inner Ring Road in Shanghai. 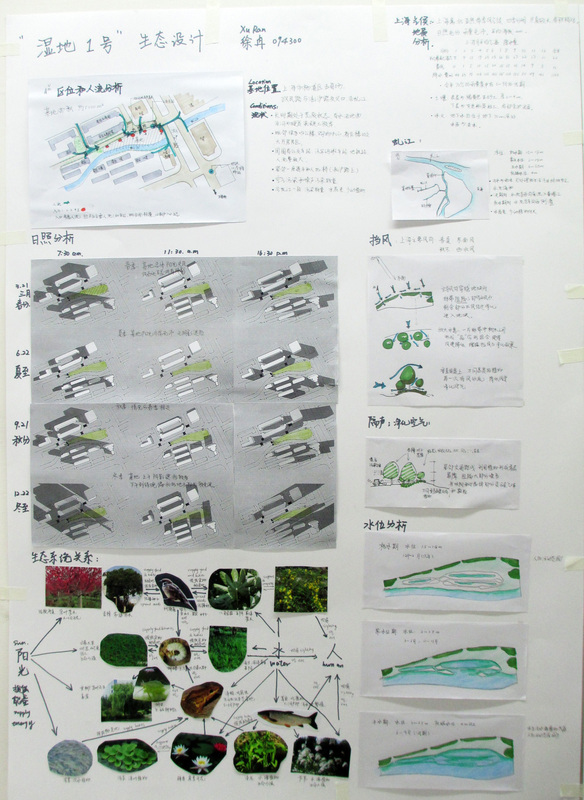 Design a local, place-specific natural ecology area of at least 500 square meters in that urban setting. Establish a suitable, restorative habitat for at least 5 plant species and 3 animal species. Ensure that the natural processes and systemic relationships of your landscape will actually diversify, improve, multiply and become richer over time, instead of slowly degrading. Attempt to simultaneously grow organic food for humans. Arrange your landscape in an aesthetically pleasing fashion, in order to create a valuable piece of inner-city, urban public space. Study and explain how your urban ecology site supports plant, animal and human needs in its surroundings and together with other green spaces in the city. Propose how your concept could be distributed and reproduced all over the city to create an even more valuable, systemic, ecology network. Study and elaborate how your space would develop over the next 50 years and how it should be managed by the responsible maintenance crew. The project lasts 5 weeks. 1st and 2nd weeks are group work; 3rd to 5th weeks are individual work. Understand the definitions and meanings of words like ‘topsoil‘, ‘habitat’, ‘exotic plants’, decay, ‘seasons’, ‘biota’, ‘pollination’, ‘microclimate’, ‘food network’, ‘ecosystem’, ‘water table’, etc. in relation to urban, natural ecology, and how they might affect your project. Read books/papers about nature-imitating landscapes, urban food production and natural ecology. Find case studies similar to your task and learn from precedents. Look for designs that try to recreate nature and its systems and processes. Look for urban agriculture and city food production cases. Walk through the city and discover obsolete sites and other potential locations for your project. Visit landscaped sites and parks and try to evaluate to what level they are suitable for wild/natural plant and animal growth and why. Investigate which animals and plants would easily grow, survive and develop in Shanghai City. Study their requirements for feeding, resting, mating, reproducing, breeding, nurturing, hunting, escaping, hiding, growing, etc. and try to understand what other species they might need to feel comfortable. Try to define and recreate their living space and food network; design their ecosystem. Evaluate which ones of these species and their products could also be eaten by humans, or which human crops/foods could be grown/produced in the same place without disturbing (but hopefully contributing to) your ecosystem. Select a real site in the city according to your established criteria for rain, orientation, size, shape, topography, wind, sunshine, soil composition, linkages, etc. Examine which sites are appropriate for which species to flourish and develop. Begin designing your site layout. Study how to create the specific components of habitat that you need to offer in your ecosystem. Decide where and when the people and certain individuals have access to your site. Think how the plants will grow over time to establish and develop the different functions for animals and humans. Design your landscape so that animals can fulfill their daily and seasonal needs and define how they could travel to other sites or connect with other individuals of their species. Develop your design, detail the different spaces and niches, define the plants and animals that you will introduce, define their locations, distribution, quantities, densities, distances, combinations, draw the food network diagrams, illustrate their daily and seasonal life and occupations, etc. Finalize your design; generate master plans and sections as well as detailed drawings and specifications for implementing your design. Illustrate how your site will develop and look over time. Explain how the city landscape maintenance crew should care (or not?!) for your landscape. Elaborate how often you will be able to collect which foods for humans and who will harvest and obtain them. Show how your concept could spread over the city and what effect it would have. 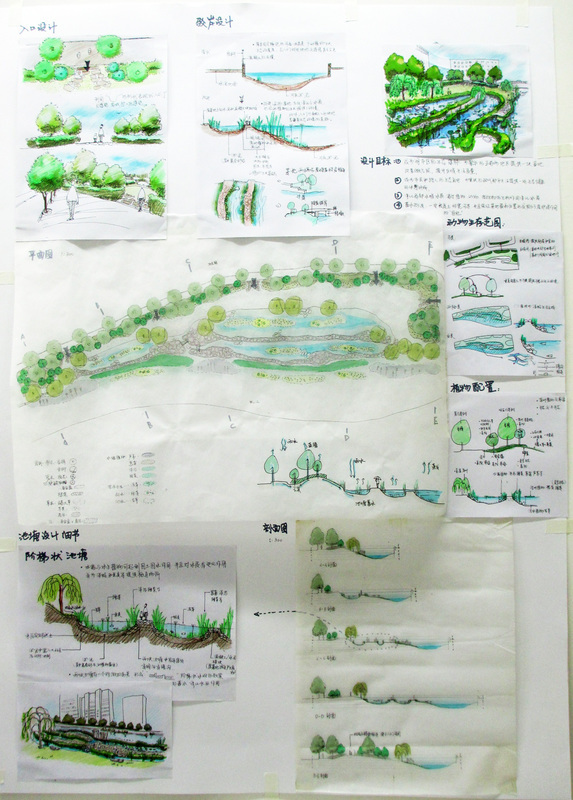 Does your landscape project fit the circumstances and characteristics of Shanghai city? Are the proposed vegetation, animals, and human foods suitable/ fit for this site? Does your proposal create an ecosystem? Habitat? Food network? Is your concept reproducible over the city? Would it create an ecological benefit for the city and its residents? Is your proposal attractive/beneficial/useful/health-improving to the citizens – directly and indirectly? The final submittal comprises a completed handed-in design and explanation document from each individual student. Deadline is Thursday, November 8, 2012, 08:30. Late submittals are not accepted. Please do not hesitate to ask if you have any questions. We are looking forward to working with you.